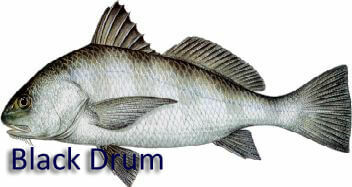 Information on Black Drum Fish Species. Description: high arched back; 10 to 14 pairs of chin barbels; gray or black colored body in adults; young have 4 to 6 vertical bars; has cobblestone-like teeth capable of crushing oysters; scales large. Similar Fish: the vertical bars on juvenile black drum are somewhat similar to those on sheepshead, Archosargus probatocephalus; spadefish, Chaetodipterus faber; red drum, Sciaenops ocellatus. found: INSHORE fish common to bays and lagoons; bottom dweller often found around oyster beds; also OFFSHORE. Are being caught over 100 lbs. Remarks: largest member of the drum family; spawns NEARSHORE in winter and early spring; feeds on oysters, mussels, crabs, shrimp and occasionally fish; longevity to 35 or more years.